At Ezi Storage we have over 240 storage units that come in 15 different sizes, conveniently located near the freeway in Osborne Park. Call us on 1300 730 306 and we can help find the right solution for your storage needs. Moving house or need some additional space? Short term or long term, we have highly secure storage units in a wide range of sizes to suit your needs. Your own small business warehouse. Fully enclosed to ensure security and protection from weather, dust and temperature fluctuations. Don’t require a whole unit? Our new single item storage service is now available, perfect for occasional use equipment (golf clubs, surf boards etc) and bulky items. 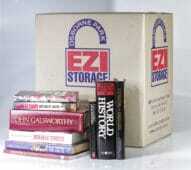 When it comes to storage in Perth, Ezi Storage is the number one choice. Situated on Scarborough Beach Road, Osborne Park, our secure storage units are easily accessible from the freeway for people in the north and south of Perth. With Ezi Storage, your self storage units are housed undercover inside our warehouse providing a range of important additional benefits, including protection from weather, dust and temperature fluctuations that you would experience inside a normal storage facility. Ezi Storage stock a wide selection of packing boxes including moving boxes, tea chests, wine boxes and archive boxes plus all the packaging materials you’ll need to keep your valuables in excellent condition. Shop now for all your packing needs.